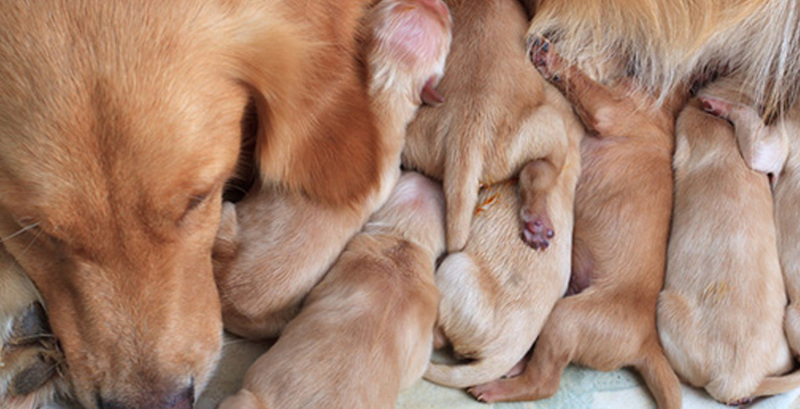 The birth of a litter of puppies is a magical moment. We must be prepared for this and we must know what we have to do in order to ensure a safe and uncomplicated delivery. The delivery of a female dog is laborious, but nature is wise and the mother knows what she has to do. You just need to prepare an area where the female dog feels comfortable delivering, clean towels in case they are needed and you must monitor that all the puppies have come out as well as the temperature of the female dog. In addition, the emergency vet's telephone number should be near, in case complications arise. The first step is to be prepared, because from the time when it was mounted, we must count 55 to 65 days for labour to occur, although, of course, these dates are approximate and every pregnancy is different. For the delivery, it is advisable to prepare a box that fits the female dog in an area secluded from the daily hustle, and to leave some clean and old newspapers or blankets in it. Guessing the day that the female dog will deliver is complicated, but there are a number of signs that tell us that the time is near. It may try to seek seclusion or, on the contrary, it may seek our support more than ever. Its body temperature may drop to under 37–37.5º C two days before labour; it may stop eating, or it may even vomit, and it may approach and even constantly stir the place you have prepared for it. Once it begins labour, the best we can do is let nature take its course and let the female dog deliver the puppies by herself. When it breaks water it is important for the first puppy to appear soon, and once it is born, the mother cuts the umbilical cord and licks it so that it breathes. The rest of the litter will come at regular intervals, and to make sure that they have all come out, we must feel the belly of the female dog. At birth, puppies are deaf and blind, and it is the the mother who positions them for suckling. Only in the case that one of them does not suckle can we can pick it up and help it reach the teat. During the first weeks the female dog will take care of protecting them, providing them heat and encouraging them to relieve themselves. The first few days we should keep them away from children, especially if they are very small. Occasionally, as it happens with large litters or due to maternal illness, some puppies may need to be fed with bottles. It is important to use artificial female dog milk, which can be found in specialised shops. During the first week, puppies need up to 15 daily feedings, and from the second week their needs are reduced to 8 feedings. Night feedings will also be staggered in time. Therefore, we must be prepared and know all the steps, as if it were the birth of more family members. We must observe the behaviour of our female dog, prepare its delivery area and let its maternal instinct do its job, but always make sure that everything is going well. As puppies are delivered, we must make sure that the mother cuts the cord, and that they breathe and suckle. From there on it is best to leave it alone so it can take care of its newborns during the first few weeks.